NFL Draft Attack will provide information covering the 2013 NFL Draft, with specific focus on the Buffalo Bills. Events including the Senior Bowl, Combine, and Individual Pro Days will be discussed as well. This is our 1 and only mock draft. We will have reactions after the 1st round to see how we did. This is our final rankings of our top 50 players this year. Remember these rankings are based on the college tape of each player. We release our first of 2 mock drafts this Saturday April 20th. Buddy Nix usually makes no secrets of his teams biggest positional needs every year, and how he plans to upgrade them. In 2010, he constantly talked about adding a pass-catching running back, and acted on it by taking CJ Spiller. The next year, he constantly referred to the abysmal run defense, and along came Marcel Dareus. This winter he has continually referred to his plan of drafting a franchise qb, a big physical wide receiver, and at least 2 line backers. Nix is becoming more predictable each year in his draft plans. His love for the ACC and SEC college football conferences is well documented. That said, for the purpose of this write up, I will be looking briefly at a handful of potential WR’s that I think Buffalo will be targeting within the first 3 rounds, specifically from those regions. Hopkins will likely hear his name in round 1-2 at the draft. There is alot to like about Hopkins when projecting him to the NFL. Good size and hands of course. More importantly, he has 3 straight years of production, recording over 50 catches each year, and broke school records for receiving yards and touchdowns. Hopkins got significantly better each season as well. He capped a great career at Clemson for over 1400 yards and 18 td’s in the 2012 season. 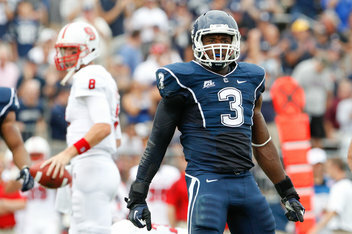 From watching him, he looks really fluid and shows impressive hand strength, snatching the ball even when hes covered. He shows toughness in the middle, and doesn’t fear going into traffic. Perhaps his biggest strength is his run after catch ability. Hopkins shows great playmaking ability after the ball is secured. Don’t look for Hopkins to be a combine standout, but his skill set is still impressive. His production will attract significant attention. I think he could be a great value in round 2 for any team, and he makes alot of sense for the Bills. Terrence Williams flourished last season even without RGIII. 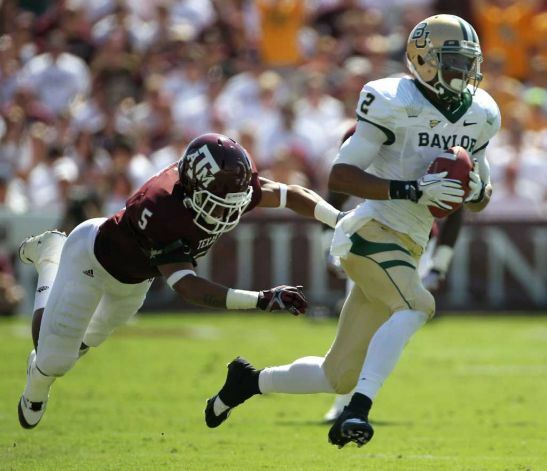 Williams put up solid numbers at Baylor, even after losing RGIII. He has the ability to make tough catches even when hes covered. At times he looks a bit rigid in running his routes. To me, he doesnt have the natural look that some of the other WR’s in this class have. I’m not as big on Williams as others are but I still think come draft day he will go between rounds 2-4. Hamilton was the go-to-guy this year for QB Tyler Wilson. I think he has the right size to be a good possession WR. He also shows some great speed after the catch. The one issue I have with Hamilton is only 1 year of real production. He went from catching 34 passes in 2011 to 90 in 2012. Arkansas had a very deep receiving group, but generally you want to see at least 2 years of consistent production. I think Hamilton has the physical ability to be a good #2 WR at the NFL level. He really flourished when he was given the opportunity, however I didn’t see enough big plays out of him to consider him in the first 2 rounds. He may be a viable 3rd round option going forward. Patterson has a chance to be the first WR selected. Patterson is another WR with only 1 year of production, but his physical skill set is really impressive. Absolute playmaker. He’s a smooth route runner, and has very reliable hands. I like his toughness too. Very solid possession type receiver. He doesnt strike me as a burner, but shows more than enough down field play making ability. Lots of versatility with Patterson also, as he was used as a kick returner and even a running back in certain situations. I think #8 might be too high for Patterson, but right now, all signs point to being one of the first 2 receivers taken. These are obviously just a few names that might be linked to Buffalo over the next 2 months. We will start looking more in depth at these WR’s along with others after the combine. It seems like every year before the combine, there are numerous quarterbacks grouped together in terms of where the “experts” predict they will be selected. This year is no different. While the consensus seems to be that Geno Smith from West Virginia is the most complete athlete, and safest 1st round qb, there is absolutely no guarantee which one will come off the board first. Newton had an incredible pre draft process, vaulting himself to the top of the 2011 class. In 2011, the hype before the combine belonged mostly to Blaine Gabbert from Mizzou, who seemed to come from out of nowhere. 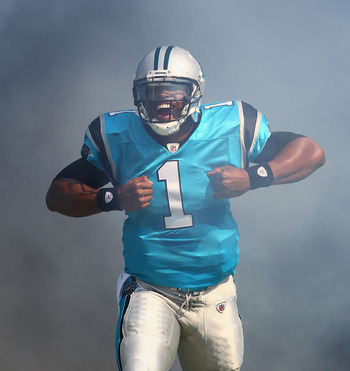 Enter Cam Newton. Yes, Cam had an incredible year at Auburn, winning a national championship, but between character issues and mechanical flaws, there were alot of question marks with him. Newton chose to throw at the combine, and he dazzled scouts. He followed this up with the now infamous private workout he held in San Diego thereafter. After that, his stock absolutely sky rocketed. Respected draft analysts like Gil Brandt, and Trent Dilfer gushed over the natural ability of Newton. I believe he is a perfect example of how the process leading up to the draft can immensely affect a players stock. Although nobody knows what kind of long term career he will have in the NFL, he did everything physically right before the draft and ended up being the #1 pick. Glennon has all the physical ability that will allow him to perform at the combine. 2) Standing 6’6, he has above average field vision, looks the part of a prototypical pocket passer, and has above average accuracy (60% avg over last 2 years). 3) Fluid Mechanics. 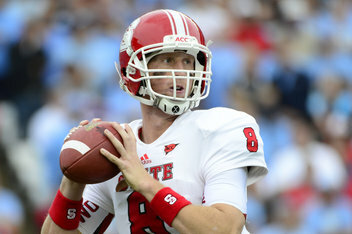 Glennon has a smooth arm motion, allowing him to deliver the ball with accuracy and strength. 1) Hes a statue, cant detect or avoid pressure. 2) He’s highly inconsistent, will continually miss open targets, and “easy” completions. 3) Doesn’t have the demeanor of a “gamer”. Not an “in your face” personality. I went back and watched tape of Glennon from 2011 and most of 2012, and I think there is some truth and myth to all of the above. His pocket awareness is quite underrated in my opinion. That’s not to say he will be making defenders miss anytime soon, but I thought he showed more than adequate awareness and decent mobility for a guy his size. 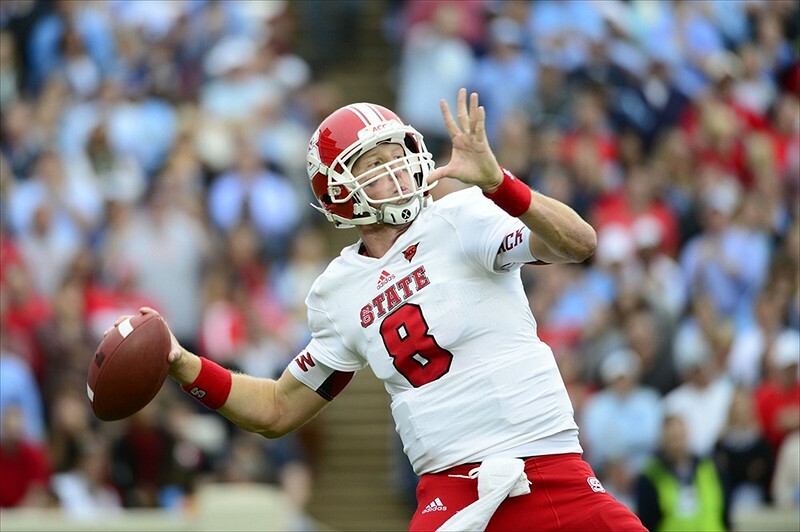 Arm Strength, Solid Mechanics, and Signature Wins will help Glennon come draft day. He does miss open targets and will make you crazy with missing easier throws. However, he also will make some incredible throws with his all world arm. I think hes the most accurate qb on the run in this draft. 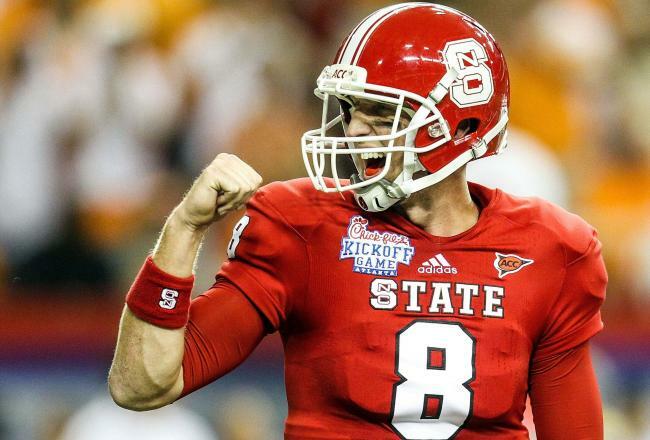 What really impressed me were some of the big wins in Glennons career at NC State. The biggest win of his came in 2012 when he led a 2nd half comeback against #2 Florida State. 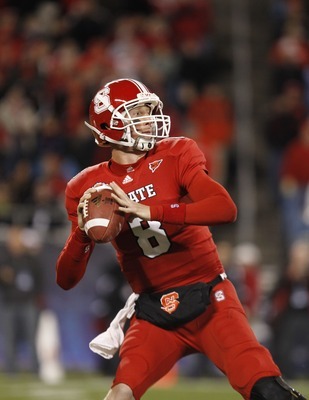 In 2011, he was responsible for the biggest comeback in NC State history, trailing by 27 points in the 2nd half against Maryland, throwing for 5 td’s. He also was fantastic in a 2011 beat down of Clemson, who was the #7 team in the nation at the time. So what does this all mean? By no means to I think Glennon will put himself anywhere near the #1 pick, as Newton secured, but I do feel he will vault himself over the next 2 months. I think Glennon is going to light up the combine, and dazzle with his arm talent. The more scouts look into Glennon, I think they will see what I have; the guy is a first round talent. He has the physical ability, the smarts, and the production that says so. Whatever team selects him will have to take the good with the bad, however ask any New York Giants fan about that with Eli Manning, or even Ravens fans with Joe Flacco. Why does Glennon make sense for the Bills? Could Glennon be the pick at #8 for the Bills? – The arm strength will allow him to rip the ball through swirling winds and bad weather. -Glennon will need a rock solid offensive line to maximize his time in the pocket to scan the field and deliver. He will have that in Buffalo with a proven interior line and promising left tackle, Cordy Glenn. – What better way to support any young qb then to give him CJ Spiller? The spot where Glennon goes will of course depend of fit. Wherever he goes it will be up to that franchise to support him and play to his strengths. My opinion is that come draft day, Mike Glennon will have done enough to put himself not only into the first round, but potentially the #8 pick to The Buffalo Bills. The all-star games have passed and as the combine approaches, NFL hopefuls prepare their bodies for what will be the most intense job interview they will ever face. They will be examined, poked, prodded and gazed at by hundreds of coaches, scouts, general managers, and other front office personnel. They will be pushed to their limit physically and mentally. These players have put their skills on display in the colligate ranks for the last several years, jockeying to get tothe top of the depth chart, and BCS standings. Now, they all will be fighting for the top spot at their position rankings. A handful of prospects have increased their stock with their performances at the conglomerate of post season talent gatherings. See left tackle Eric Fisher from Central Michigan and outside linebacker Sio Moore from Connecticut, just to mention a few. While others must take advantage of the 7 day NFL scouting combine, held at Lucas Oil Stadium in Indianapolis, to promote their individual stock. There has always been “workout warriors” in the 30 previous years of the National Invitational Camp, as it was formerly known as, and it is a pretty good bet that this phenomenon will continue. This label can help and/or hurt a prospects draft stock. Prospects beware – if that term “workout warrior” gets attached to you at the combine, your game film better back up that claim. One of the most recent prospects to be labeled “workout warriors” is, Vernon Gholston (Ohio State, taken 6th overall by the Jets in 2008). But the most infamous of these workout warriors is Mike Mamula . He torched the combine, coming out of Boston College in 1995. He played both outside linebacker in the 3-4 and defensive end in the 4-3. Mamula had an extremely impressive 40 yard dash time for his size and position. Mike Mamula was one of the first prospects to specifically train for the combine drills leading up the event. He was years ahead of his time. Today, a mind boggling number of prospects train to the combine drills, like the 40 yard dash, 3-cone drill, bench press, broad jump, vertical jump. There has been an explosion of pre-combine and pre-draft prep athletic companies in the last ten years as a result. While Mike Mamula’s career stats do not justify the 6th overall pick, he did have a solid career. Without the injuries throughout his career he might have had more of an impact, and may have been more able to defend his lofty draft position. On the other hand Vernon Gholston has never lived up to his draft position. He is currently a free agent, after never recording an NFL sack in four seasons. The money is far less of an impact now, as opposed to when Gholston was taken 6th overall. This gives teams more flexibility to take chances on players that are tagged “workout warriors”. But buyers beware. 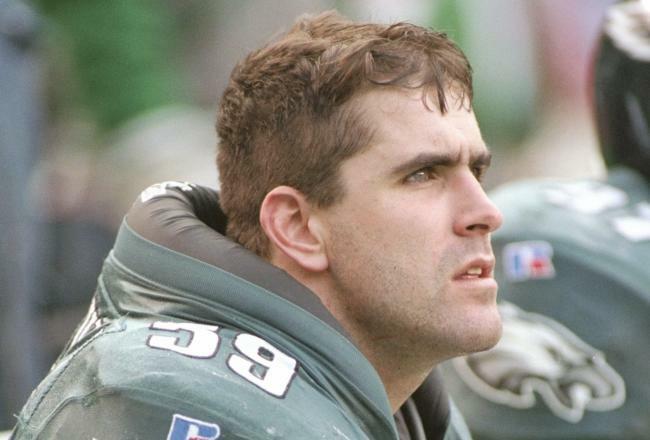 Mike Mamula is a notorious “workout warrior”, who benefited greatly from the Combine. Most scouts have their prospect profiles trimmed and polished by now. If a prospect blows up during the week, it will either justify what is already in those reports or it will open them back up to more film study and interpretation. A player’s performance at the combine should never dramatically vault a draft stock, nor should it make one’s stock nose dive either. A prospect must always remember one thing, the game film never lies. Each year, a few new qb prospects seem to surface after the college season ends. This year it seems like Glennon and Nassib were the hot names of the month. As January comes to a close, the focus will now be on the NFL Scouting Combine, which will be held February 20-26 in Indianapolis. This is a time period, where more qbs that were highly regarded during the season will become a larger part of the conversation. Barkley was a 4 year starter for the trojans, compiling an overall record of 34-15. He finished his career with 116 touchdowns, and 48 interceptions. His numbers are definitely impressive, but at a closer look, what impresses me most is considering the way Barkley played under circumstances which were far from ideal. 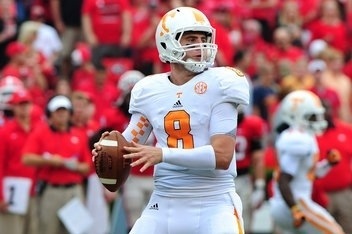 I think he possesses the strongest leadership of any quarterback in this years draft. He probably won’t wow anybody with arm strength, but he doesn’t need to. He has a terrific skill set, including superior accuracy, practical mobility, and intelligence. 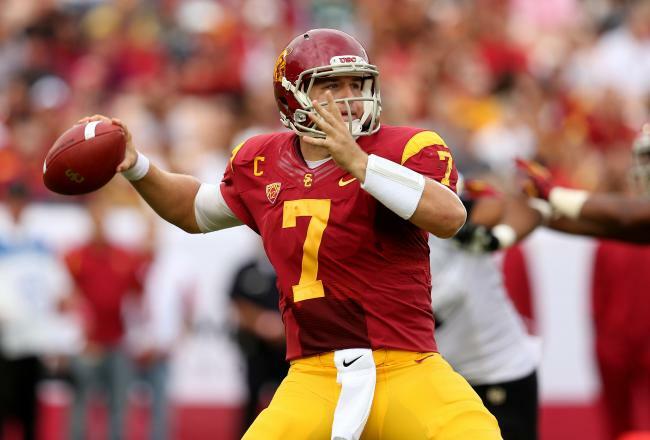 USC had lots of problems in Barkley’s senior year, and he might take some of that blame, however I think he is the most well rounded QB of any in this class. I think you will hear about the “it” factor with Barkley more than anyone else this year. Although the may not be able to participate in physical drills, as he is recovering from shoulder surgery, the combine is a perfect spot for him to come in and impress nfl personnel in the classroom and in interviews. 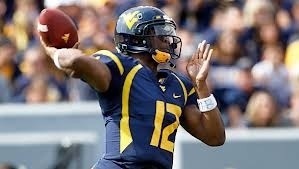 This is where I believe Barkley will shine, and ultimately put himself in place to be the 1st QB selected in the draft. Geno capped an incredible career at West Virginia with a phenomenal senior season. His numbers were just ridiculous. 42 touchdowns and only 6 interceptions. He just shredded defenses both through the air and on the ground. At times the guy looked like the undoubted best quarterback in college football. What might really hurt Smiths shot at being the first qb selected is the fact that he lost 6 of his last 8 games, including a 5 game losing streak. I’m not sure if that will be enough to scare gm’s away, but I do know that it is absolutely noteworthy. Franchise qb’s can’t have losing streaks like that, no matter what. When I watch Smith, I see supreme physical ability that could allow him to be elite at the nfl level. The problem is that it isn’t there all the time. From a numbers standpoint, you won’t find a qb more impressive. The big question is if he can bring it at a consistent level going forward. I’m not sure there is a qb in this draft that’s more interesting than Bray. Opinion and speculation on him are all over the place. 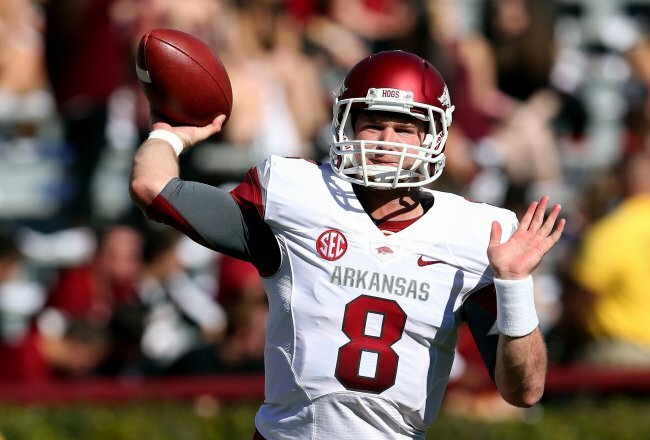 His situation reminds me a little bit of former Arkansas qb, Ryan Mallett. You know he has the physical tools to perform, but one of the biggest concerns with him is work ethic. His physical skill set is definitely intriguing. Bray has a huge arm, can chuck the deep ball probably better than any other qb in the class. He has the ability to throw the medium to long range passes with great touch, and can put zip on it when needed. He’s 6’6, and has decent mobility for that size. 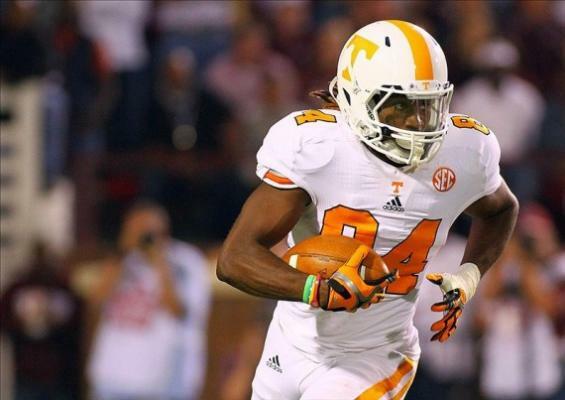 He managed to put up some solid numbers last season (34 tds, 12 ints) in the SEC while on a pretty weak team. The other knock against Bray is his performance against good competition. He finished last year with a 5-7 record, and didn’t beat anybody noteworthy. The combine seems tailor made for a guy like Bray. He will be able to showcase his arm no question. Where issues might arise for him will be in the interviews. When its all said and done,this could be an event that vaults him into the 1st round conversation based on how he presents himself as a leader. From a physical standpoint, he has 1st round talent. These are just a few names that will start to get some buzz leading into the combine. We will get deeper into each player with full profiles going forward. Check back early next week to see what names you will start to hear about at other positions as the anticipation for the combine builds. 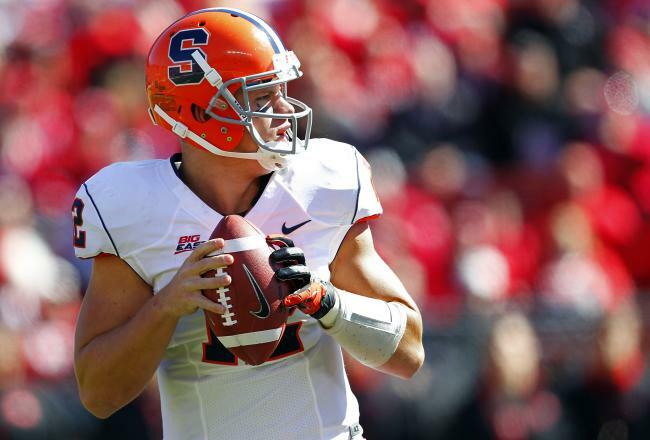 Senior bowl week ended without any of the qb’s separating themselves from the pack. While they all struggled at some point in the game, I think Mike Glennon and EJ Manuel were the strongest of the crop. 1) Glennon has the strongest arm of any of the qb’s in this draft. He showed flashes in the second half, including throwing a rope to Markus Wheaton of Oregon State on a comeback route, but watching him short hop 20 yard passes is maddening. 2) I think EJ Manuel may have worked himself into the 2-3rd round range with his MVP performance. He made some nice throws, but like the rest of this qb class, was inconsistent. 3) Ryan Nassib continued to struggle, only completing 4 of his 10 pass attempts, and threw an ugly interception. I think he still has time to bring his stock back up, but this week didn’t help him at all. 4) Tyler Wilson completed 8-11 passes which looks nice, until you see it was for 40 total yards. He was way too conservative in my opinion and did literally nothing to wow scouts. 5) Landry Jones was awful. 3-9, 16 yards, sacked twice. Just brutal. 6) Zack Dysert had a couple nice throws in garbage time so it probably won’t matter. 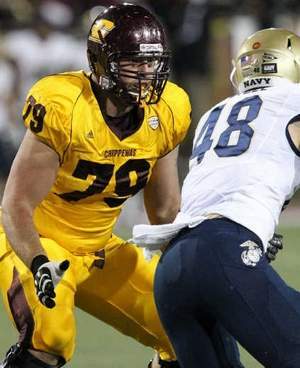 7) One offensive lineman you will hear more about are Eric Fisher of Central Michigan, who I think could be a top 5 pick. Teams will look at how Baltimore and San Fran have built up their teams through the offensive line. Joe Staley, Mike Iupati, Leonard Davis, and Anthony Davis were all 1st round picks, along with Michael Oher, and Bryant McKinnie of Baltimore. Bottom line is this. There is still some time for all of these qbs to help or hurt their stock during the combine, and individual pro days. While it seems silly since the real football games have ended, it happens every single year. The question will be who can convince scouts they have the least amount of shortcomings going forward into the NFL. Next post will focus on some other intriguing quarterbacks that were not at the senior bowl, and the other 2 glaring needs of the Bills; Wide Reciever and Linebacker.